It took me ages to finish Ghost Talkers, and it really shouldn’t have — it’s well written and well paced, the idea is fascinating, and I wanted to know what happened… I just also came over all sulky because I (foolishly, given the setting) wanted a happier ending, and what I hoped for was quashed surprisingly early in the proceedings. Not that that surprised me, but I’d been hoping it would somehow… do something else. The book did surprise me later with one or two twists and turns, but that initial disappointment made me reluctant to get on with reading it. I imagine that should very much be filed under ‘it’s not you, it’s me’. I enjoyed the main character, Ginger, and her relationship with her fiancé. I enjoyed the concept of mediums becoming involved in the war, and ghosts reporting in to them with their last known whereabouts, etc. It almost doesn’t need the murder mystery, though that experience does give Ginger a personal stake (as if the other circumstances weren’t enough) and gives Kowal a chance of demonstrating what the mediums in this situation would go through, experiencing the last moments of ghost after ghost. I wished there’d been more of some of the other mediums, especially Helen; her limitations in society given her ethnic origin would’ve made the story quite difficult if she was the main character, but I can’t help but wish she had been. Not that I didn’t love Ginger, but Helen would’ve been extra special. Overall, very enjoyable; I just wish it had dodged the plot element that I immediately predicted. It’s not that it’s a bad plot or that keeping the plot very similar while constraining one of the characters in another way wouldn’t have been rather cliché, because it’s a fun story and the workaround I’m thinking of (trying not to give spoilers) would’ve been fairly predictable in itself. And certainly, that a character experiences a major loss in the context of WWII is just appropriate. But… but… I wanted different for Ginger. For a short novella, I actually got surprisingly invested in this — and didn’t really realise until the end, where I was rooting for… something more. A rescue, a redemption, something. The sting in the tail of the story, while most of it was obvious to me, works well and adds to the meaning of everything that comes before it, which is exactly how stories should be written — especially short ones. The setting of the story, while not revolutionary — the whole idea of society being connected, of storing your memories practically in the cloud, of never being out of touch — is done well, too; not too obtrusive, and yet it permeates the story. The conceit of the typewriter and the typos, etc, just drove me a bit mad, though. Nope, cannot be doing with typos, even on purpose, apparently. But that’s a personal peeve, probably driven by my editing work, and didn’t get in the way of the story itself. In the end, I just wanted a little more. I wanted the why, and we got some of it, but I wanted the motives of people we didn’t even meet in the story. So of course it was limited by the narration, but. But. Gimme! 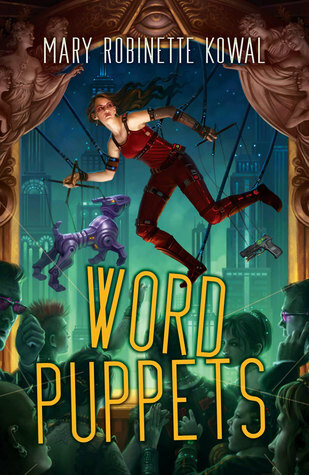 Word Puppets is a collection of short stories written by Mary Robinette Kowal, arranged — if we can trust the alleged Patrick Rothfuss’ introduction — in the order they were written. I always think that’s a fascinating way to read an author’s work, because you get to watch their skills develop, their interests change, etc. 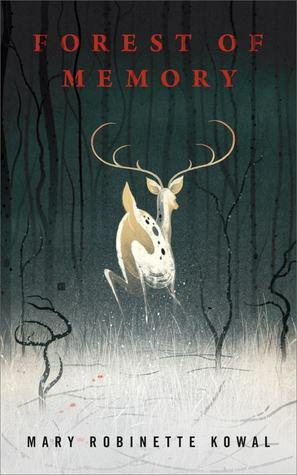 This particular collection comes with an introduction written by Pat Rothfuss… which is a little suspect because in a little game they had on twitter, Kowal was better at being Rothfuss than Rothfuss was. If that confused you, don’t worry; I think it bent more than a few brains. As a whole, in any case, it’s an entertaining collection. There were one or two weaker points, where by my personal lights the twist was just a little… I saw it coming. ‘For Solo Cello, op. 12’, for example. And looking at the list of titles, there’s some where I can’t figure out which story they were, which you can attribute either to my terrible naming or perhaps less than memorable/well-matched titles/stories. ‘For Want of a Nail’, what was that one… ah, the one with the conflicted AI. Still, for the most part I think Word Puppets is a strong collection, solidly entertaining, and what’s also nice, it has a wide range. 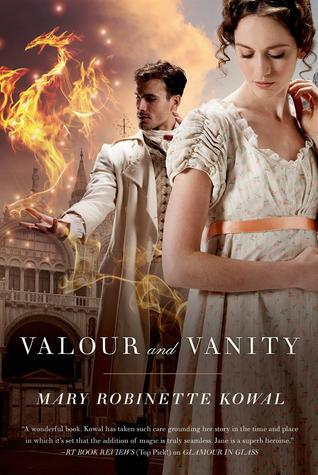 Fantasy, various kinds of spec-fic, different settings, older protagonists… And it’s definitely quite different to her Regency/fantasy novels (which I do enjoy, but it’s nice to see Kowal taking on other frontiers). I enjoyed most of the stories, and I think particularly ‘Chrysalis’, ‘Body Language’, ‘The Lady Astronaut of Mars’ and ‘The Consciousness Problem’. Some of them really are sticking in my head, to be thought about later — so that’s a good sign. These books seem to be just perfect for my brain at the moment. I read this on the train, more or less in one gulp. You’ve got to love that one of the most important threads of the story is the love between Vincent and Jane, and how it gets them through everything, no matter what. And despite how far their acts of derring-do have come from their Austen-esque beginnings in Shades of Milk and Honey, the development is clear. This time, the trouble they get into grows out of everything before (rather than being a whole new problem), which makes it tidier. I think really the blurb on the back gave a little too much away; knowing, for example, that they’re victims of ‘an elaborate heist’, I immediately began to suspect where the heist began and who was involved. But it doesn’t give away the motive, fortunately, nor what Vincent and Jane end up doing to fix the situation. It’s a lot of fun, as I’d expected, and I enjoyed the inclusion of Lord Byron as well. When I’m just reading this and not thinking too much about it, I love it. If I try and pick nits, I’m less enthused — like sometimes I just think about Jane’s behaviour for a moment too long, and want to slap her down. She jumps to conclusions, acts like Melody is brainless, dismisses her… If I think about it too much, my frustrations with Jane take the shine off things a little. So: why I like it — it’s so easy to read. I love the relationship between Vincent and Jane, at least as far as he’s concerned; I think she could stand to trust him more, but I also think that there’s reasons she doesn’t and that she works on it, which helps. I love the small ways the trauma of his past is made clear: very little is said about his father, it’s all in the way he acts, in the little tells like the nervous whine at the back of his throat… I liked Vincent’s mother’s part, the way her actions speak of the same traumas, and yet also of love and determination. I like the political plot behind this, too: the use of real history interwoven with the magic of this world, the issues with Irish people and problems of interaction between aristocracy and working people… It works pretty well, for me at least. 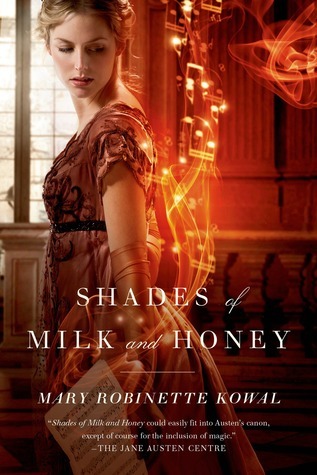 When I read Shades of Milk and Honey, I wasn’t that impressed — even when I reread it. 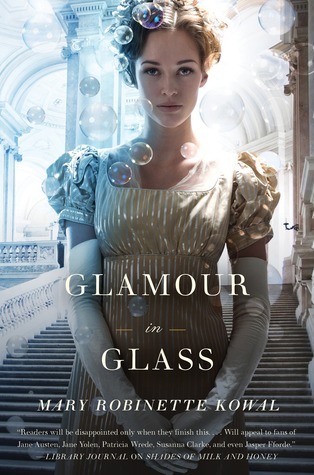 But I quite liked Glamour in Glass. Probably partly out of sheer bloodymindedness; I looked at some reviews and oh how they whined about Jane’s attitude to pregnancy in this book. And I thought, wait: that’s actually interesting. Yes, let’s address how dangerous pregnancy could be at that time. Let’s address how “confinement” literally imprisoned women. Yes! Let’s discuss the aftermath of the Austen and Heyer novels and their neat marriages: the babies, the risks to the women, how those women were limited. Someone called it anti-pregnancy, and I don’t think it’s that. It just turns to something that went unspoken in that period, and scrutinises it a little, and articulates a fear and dread of the constraints pregnancy placed upon women (shown even more clearly in this world because a woman can’t work any glamour while pregnant). It’s still a fairly light read, despite that theme; I read it in an hour and a half, so if you’re a fan of the first book, don’t think that it’s suddenly changed entirely in style and subject. This is less frothy than the first book, seriously examining the relationship between Vincent and Jane, their equality and finding a balance between them. I anticipated the political plot ahead of time (perhaps because I’m fresh from Voyage of the Basilisk); it feels a bit rushed, honestly, particularly toward the end, but I appreciated seeing Jane and Vincent facing down these issues, and his growing regard for and trust in her. I read this one before and wasn’t enormously impressed, despite reading it one go. I think that was still pre-appreciation of Austen (sorry Mum, I can’t help it) and pre-interest in anything like romance; definitely before my interest in the likes of Georgette Heyer. So an Austenesque fantasy didn’t work for me much then. 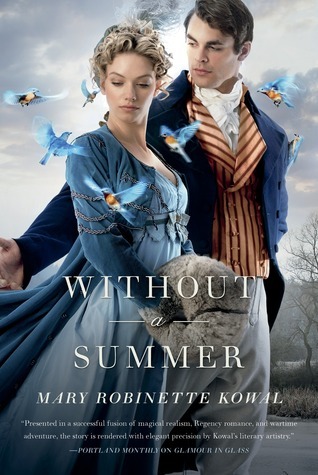 Honestly, the setting itself doesn’t quite convince me now, but that’s not because I don’t like Regency novels. It’s more that something feels off, for example when Melody says “la!” all the time. It just seems like too many period things are being sprinkled in for verisimilitude, and you don’t need all of it or so much of it. In any case, I did appreciate this one more this time. I like the way glamour is woven into the society as a female accomplishment, like painting, which men can do professionally and women are expected just to dabble in. I liked the way things worked out between the characters; Mr Dunkirk’s reactions to Jane, and how that shapes her actions; Mr Vincent’s awkwardness about his feelings. Perhaps the romance is a little sudden, but you can see how it comes about, too. The ending is rushed; what’s with those last few pages? I suppose it’s very like how we’re told at the end of an Austen or Heyer novel who married who and went to live where, but it jars when you’re reading a modern fantasy novel, at least for me. Ah well. At least I enjoyed the book more this time, and I’m looking forward to the sequels with hope.